If you have walked past Cassandra Goad in the last few weeks, it would have been difficult to have missed the beautiful window display of aloe vera cacti and brightly coloured lights. 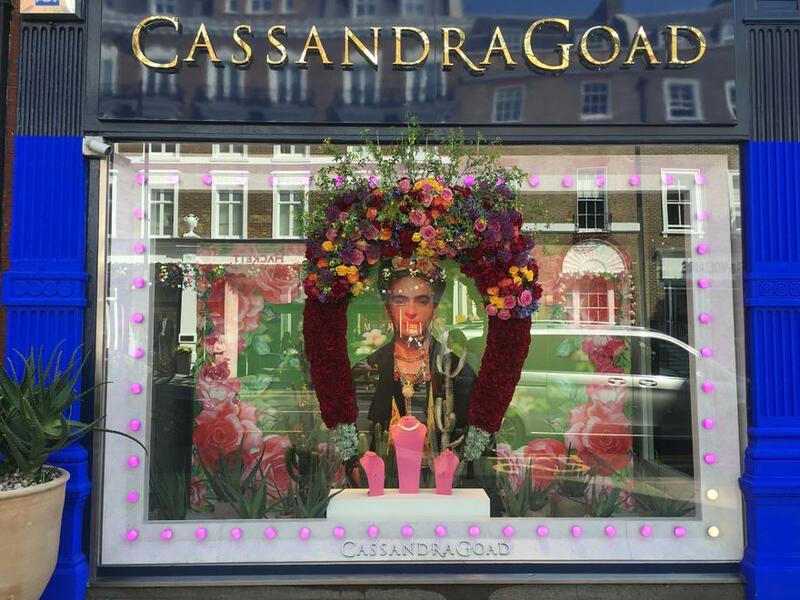 The face of Frida Kahlo, resplendent in her flower crown, jewels and exotic colours, appears hanging behind Cassandra's Mexican inspired jewels. Frida Kahlo has been a big source of inspiration for Cassandra in her latest collection- 'Ola Mexicana!'. The striking blue, red and green walls of Frida's house 'La Casa Azul' in Mexico have provided the colours for Cassandra's 'house' here on Sloane Street (we have literally painted the store front in the colours of Casa Azul). The colours on the walls both inside and out echo the vibrancy and brightness of the jewellery in the new collection. In particular, the Frida pendants, created by Cassandra to represent the basket that Frida Kahlo took to her husband, Diego (Rivera, the great Mexican muralist painter), every day with his lunch. With Frida Kahlo being so present at Cassandra Goad, there was such excitement when we heard about the Frida Kahlo exhibition opening at the V & A museum. It is the first time that the artefacts and clothing have been shown outside of Mexico. We are delighted that almost 65 years after her death; Frida Kahlo's story is finally being heard.